My grandfather once told me that to ‘make your million’ (a million dollars was a lot back in the eighties! ), all you had to do was create a super cheap, collectible toy for kids and turn it into a craze. I’ve thought about what he said so many times in recent years as I shell out for my boys’ various must-have obsessions, most recently useless little nuggets called ‘Gogo Crazy Bones’. So I’m bracing myself and my wallet for the latest fad – rubber bands. On a kid’s wrist, Silly Bandz look like a colourful rubber band but take them off and they revert into one of hundreds of different shapes, from rainforest animals to musical instruments. Naturally, Silly Bandz aren’t designed to be worn alone – children stack them on their wrists and trade them, the more the better. There’s a Silly Bandz Facebook page with more than 325,000 devoted fans, multiple YouTube clips of kids showing their collections and ‘rare’ bands are hot property on eBay. There’s even a rap song written about Silly Bandz. 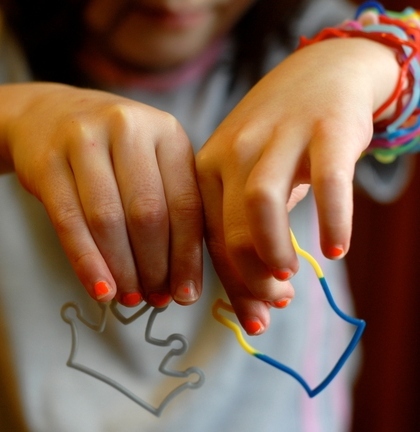 And to further cement the cult status of Silly Bandz, most schools in the US have banned them – as most parents know, a ban just adds fuel to the fire. If that’s not enough fuel, know that Silly Bandz have a ‘Justin Bieber’ set arriving soon, complete with a ‘I Heart JB’ band and one shaped like headphones. Packs of Silly Bandz start at US$1.95 for twelve bands. You can buy directly from Silly Bandz but I suggest sitting tight, I’m sure they’ll be here in no time.